This is a big topic! It has many moral, ethical, religious aspects. This web site's authors had not devoted significant resources to cover this topic prior to the time that the "Obamacare" health care reform bill was passed by Congress in late 2010-MAR. But since the passage of that bill by Congress, and its signing into law on 2010-MAR-24, there has been growing interest this topic. On 2012-JUN-28, the U.S. Supreme Court found the Affordable Care Act (ACA) to be constitutional by its usual 5 to 4 vote. Justice Roberts, a conservative Justice, sided with the moderate/liberal wing of the court and helped authorize the ruling; Justice Kennedy, who is often unpredictable, sided with the strict constructionists and was part of the minority. During 2017-MAR, at the time of the seventh anniversary of the passage of the Affordable Care Act, President Trump, Speaker of the House Paul Ryan, and many Republicans attempted to repeal Obamacare and replace it with their own American Health Care Act (AHCA). Public support for the new bill was under 20%, largely because it would cause so many millions of people to lose their healthcare access. Republicans in the House were unable to scrape up enough votes to pass the bill. Every Democrat was prepared to vote against the AHCA. The bill was later extensively modified and very narrowly passed by the House in spite of every Democrat having voted against the bill. By 2017-MAY it was in the Senate where it died. During late 2017-SEP, still another attempt was made to repeal Obamacare and pass a replacement bill. The Senate was under pressure to pass the bill by the end of September. On OCT-01, the Senate would have to vote 60 votes or more -- instead of 50 -- in favor of the bill in order to pass it. This is hopelessly unreachable. An article by NPR titled: "Latest GOP Effort To Replace Obamacare Could End Health Care For Millions," says it all! Part 11 Bill sits in the Senate. Part 12 More reactions. How many people will die? Part 13 Webmaster's recommendation. Religious aspects of the AHCA. "What Would Jesus Do?" Jimmy Kimmel's Comment Goes Viral. Part 14 Public opinion of the Senate's version of the Better Care Reconciliation Act (BCRA). Cuts to coverage. Part 15 U.S. Senate version of Better Care Reconciliation Act (BCRA) released. Death toll expected. Content of the bill. Congressional Budget Office report is issued. Part 16 Public opinion on BCRA. 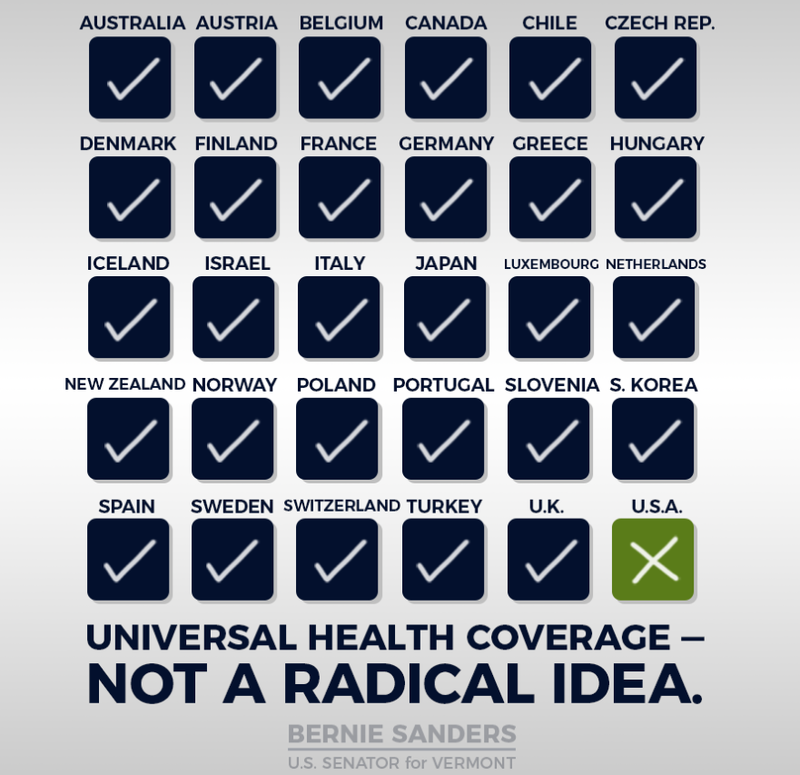 Single payer option. Two deadlines missed in Senate. Part 17 Republicans plan on repealing Obamacare without a replacement in place. Bipartisan group of governors issues statement. Part 18 2017-JUL: Public opposed to Senate bill. Trump tries blackmail. Bill fails. 2017-SEP: One Last Try to repeal Obamacare? Part 19 2017-SEP: Opposition to the Graham-Cassidy healthcare bill. Part 20 2017/8: One Last Try to repeal Obamacare Fails. Federal funding for the Children's Health Insurance Program (CHIP) lapses. Part 21 2017-OCT to 2018-JUN: Feds will no longer defend key provisions of the Affordable Care Act in court. Federal Justice Department argues in court that protection of people with pre-existing conditions is unconstitutional. Part 22 2018-JUN & JUL: Federal Justice Department attacks still another aspect of health care in court. Health care spending around the world: Liberal Democrats form a House caucus to promote "Medicare for All:"
Part 23 2018-NOV: Gallup Polls on the Affordable Care Act and about coverage for pre-existing conditions. Present U.S. health care system highly disliked. 2018-DEC: President Trump's poll ratings. Court declares Affordable Care Act (Obamacare) mandate to be unconstitutional. An essay donated by: Gabriel Gherasim: " 'The Final Solution,' or 'Am I worth living'?" A Wall Street Journal Best Book of 2017. It is available in Kindle, Hardcover, Paperback, Audiobook, and Audio CD formats at prices ranging from U.S.$12.55 to $18.07 with the Kindle format being the cheapest, as usual. "In these troubled times, perhaps no institution has unraveled more quickly and more completely than American medicine. In only a few decades, the medical system has been overrun by organizations seeking to exploit for profit the trust that vulnerable and sick Americans place in their healthcare. Our politicians have proven themselves either unwilling or incapable of reining in the increasingly outrageous costs faced by patients, and market-based solutions only seem to funnel larger and larger sums of our money into the hands of corporations. Impossibly high insurance premiums and inexplicably large bills have become facts of life. Fatalism has set in. Very quickly Americans have been made to accept paying more for less. How did things get so bad so fast? Breaking down this monolithic business into the individual industries -- the hospitals, doctors, insurance companies, and drug manufacturers -- that together constitute our healthcare system, Rosenthal exposes the recent evolution of American medicine as never before. How did healthcare, the caring endeavor, become healthcare, the highly profitable industry? Hospital systems, which are managed by business executives, behave like predatory lenders, hounding patients and seizing their homes. Research charities are in bed with big pharmaceutical companies, which surreptitiously profit from the donations made by working people. Patients receive bills in code, from entrepreneurial doctors they never even saw." To learn about other books that you can safely buy online on this topic or any other topic, go to www.amazon.com.